Quality Fiber Recycling Recycling of UBC – Used Beverage Cartons – is an opportunity to get good quality fiber reuse. 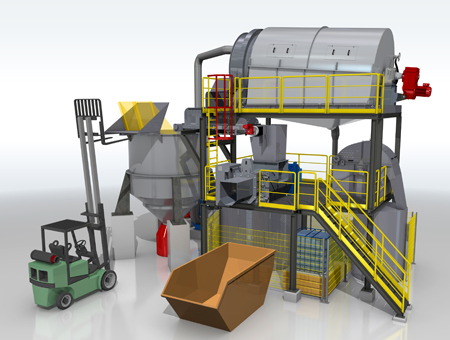 The UBC Recycle Module is a “ready to dock” equipment package which can be operational within a short time at any paper mill and works independent from the mill’s main stock preparation plant. Received UBC is forwarded in single or multiple shifts via a forklift to the pulper. Pulping combined with washing allows for a flexible operation and best results. The paper mill receives the fiber stream pre-thickened, the Poly-AL residual fraction is dewatered, pressed and ready for further reuse. The UBC Module operates independently, reuses internally pre-treated water and allows stop and go or partial operation as well. A minimum of operational assistance is therefore required. 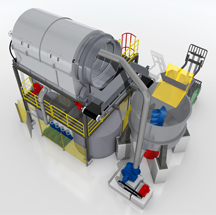 The UBC Recycle Module can be equipped with additional/optional modules for fiber thickening and Poly-AL residual pelleting, which allows an independent operation e.g. in recycling plants even away from paper mills.